With his graduation collection ODA the 24 year old George Bezhanishvili, who started working in fashion when he was just 17 years old, pays homage to an ancestry, Oriental origin with all its inhabitants and ethnic beginnings while every outfit being a new stop, a new influence or a fresh breath of fantasy. 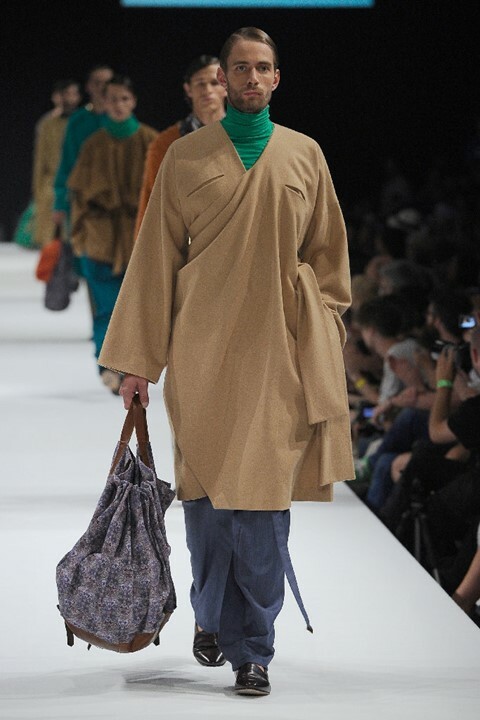 Wanting men to start having the same range of choices when it comes to fashion as women do, the collection is full of exploding colours and prints, rigid as well as fluid fabrics, padded jackets and coats accompanied by bags and handmade metal bracelets and necklaces. Dazed Digital: How did you get involved with fashion design? George Bezhanishvili: From an early stage the only way I could express myself and communicate with the world was through the language of Fashion. There are people who dress up and there are people who dress down, but there are few who dress out, feeling fashion as a second skin to inhabit. I am one of those. George Bezhanishvili: ODA is the name of the collection that was created in collaboration with designer Franziska Fuerpass. It is inspired by Caucasian in particular Georgian traditional costume details, impregnated with pigment colours of Jean-Leon Gerome’s academicism paintings. The prints for the bags and jackets have been inspired by Persian carpet patterns. I finished the looks with heavy handmade metal bracelets and necklaces, which in a way wrap the looks up for me. The collection is the radar towards eastern direction historically, awakening the fighting courage in each piece. Inventing a male shadow in a revolutionary but at the same time in an extremely honourable, truly masculine way – celebrating the birth of a resistance gene in an Arabesque warrior spirit. DD: How do you start of working? Do you have anyone in mind when you are designing? DD: You studied under Veronique Branquinho and later under Bernhard Willhelm. How did their very different style influence your work? George Bezhanishvili: Veronique Branquinho is a very special person to my life and me; I learned a lot of important things from her. The small details and twists that make clothes special and the attention to finishing a garment. I can’t say much about working with Bernhard Willhelm, since I have not spent a lot of time with him. Calling him an influence would be difficult. George Bezhanishvili: Obviously deepening the knowledge of my craft is on the top of the list. This year I was lucky enough to win the Austria Fashion Award, which will grant me a year of experience at an international designer house. In between I would love to travel and simply enjoy life, which for me sometimes translates as pure romance.